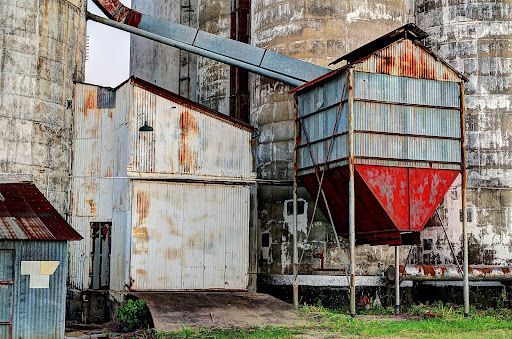 Another shot from the rice mills in old Katy. The diffuse front lighting made the processing in Photomatix a little more tricky. The reduced shadow cues from the lighting combined with a relatively large depth of field putting all the buildings in focus means that depth perspective in the image is reduced, making all the buildings look like they're on the same plane. And that can really be exacerbated by Photomatix when it amps up the texture detail on the all the building surfaces. The end result can be a really dense, cluttered look. After playing around with it for quite awhile, I decided that the best results used exposure fusion rather than tone mapping in Photomatix. Exposure fusion and tone mapping are methods supported by Photomatix for combining the bracketed source photos. Tone mapping is the more commonly used method. Photomatix first creates a 32-bit composite HDR image from the component images photos. The composite can't be displayed or printed because standard monitors and printers lack the dynamic range to deal with the 32-bit image. That's where "tone mapping" comes into play. Basically, tone mapping scales each pixel to a range supported by printers and monitors. You have some control over the tone mapping process, which is how you get that "HDR look" (or not). With exposure fusion, the component images are combined so that highlight details are taken from underexposed component images and shadows details from the overexposed component images, with the resulting image maintaining the standard bit-depth (as opposed to expanding it to 32-bit). Technically exposure fusion doesn't result in an HDR photo. But from a practical standpoitn for this photo, exposure fusion is simply less aggressive at brightening shadow details and thus preserving some depth perspective, so it resulted in a better final product. In today's age of HDTV is anybody making monitors that can handle 32 bit? 64 bit? I don't think so. I think that HDTV has high (relatively) resolution, but not high dynamic range. It would be awfully cool though!